CONCORD, N.C. (June 16, 2015) – Charlotte-area mascots took over the frontstretch quarter-mile oval of Charlotte Motor Speedway as Hugo the Hornet scored the win in the third round of the Bojangles’ Summer Shootout Series. Devin O’Connell and Daniel Wilk were among the winners in the full slate of Legend Car and Bandolero feature events on Tuesday night. Lug Nut, the world’s fastest mascot, was defeated in the Mascot Mania go-kart race as Hugo the Hornet took home the win in the furriest feature of the evening. The Charlotte Hornets mascot paced the field for most of the race, crossing the line ahead of RevPar of the Cabarrus County Convention and Visitors Bureau in second and Sir Purr of the Carolina Panthers in third. Rounding out the field was Big Stuff from Winthrop University, Blue from Charlotte Hounds Lacrosse, Bo from Bojangles’, Norm the Niner from UNC Charlotte, Lug Nut, Chubby Checker with the Charlotte Checkers and Tim E. Gator from the Kannapolis Intimidators. O’Connell raced his way to the checkered flag in Tuesday night’s Semi-Pro feature. After reaching the 20-minute time limit, the 25-lap race was called after lap 11. Joe Graf Jr. was the leader for the first six laps of the race while O’Connell battled neck-and-neck with Sheldon Crouse before taking the second position. O’Connell was able to take the lead from Graf on lap 7 prior to a wreck in Turn 3 involving Riley Herbst and held on to the top spot after the caution, cruising to the victory. Crouse and Jensen Jorgensen finished second and third, respectively. There was a tough start for the LiveWell Homes Bandolero Bandits feature Tuesday evening as multiple cautions marred the beginning of the race. There were fierce battles between Wilk, DJ Canipe and Cameron Bolen throughout the 20-lap feature, but it would be Wilk who crossed the line to win his third race of the season. Canipe finished second, followed by Bolen. Other winners included Leland Honeyman in the Beginner Bandits division, Michael Torres in the Legend Car Pro division, Ashton Higgins in the Bandolero Outlaws division, Ryan Millington in the Young Lions division and Tom Pistone in the Security Force Legend Car Masters division. The Bojangles’ Summer Shootout racing action continues at Charlotte Motor Speedway on Tuesday, June 23, with Media Mayhem. 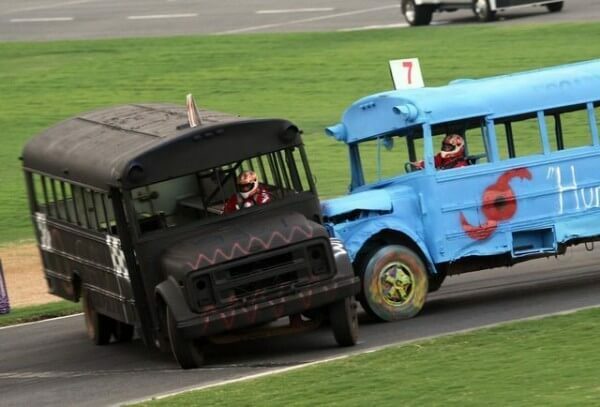 Media members will take to the track in what has become one of the most fiercely contested and highly anticipated school bus races of the summer. Fans are encouraged to come out and watch their favorite local media personality’s search for a victory, alongside the Legend and Bandolero cars on the front-stretch quarter mile. For more information on the Bojangles’ Summer Shootout Series call the Charlotte Motor Speedway ticket office at 1-800-455-FANS (3267) or visit the website. Legend Car Semi-Pro (11 laps): 1. Devin O’Connell; 2. Sheldon Crouse; 3. Jensen Jorgensen; 4. Jake Tretow; 5. Conner Pyle; 6. Scott Joy; 7. Sprout Royal; 8. Riley Herbest; 9. Joe Graf Jr.; 10. John Holleman IV; 11. Austin Langenstein; 12. Stevie Johns Jr.; 13. Andrew Farraah; 14. Jeremy Fuller; 15. Joshua Plummer; 16. Craig Biryla; 17. Taylor Jorgensen; 18. Enrique Limon; Joe Gregory. LiveWell Homes Bandits (20 laps): 1. Daniel Wilk; 2. DJ Canipe; 3. Cameron Bolen; 4. William Robusto; 5. Carson Kvapil; 6. Tommy Good; 7. Isabella Robusto; 8. Mini Tyrell; 9. Bryson Ruff; 10. Ryan Israel; 11. Dylan Notaro; 12. Jaiden Reyna; 13. Hunter Hutchens; 14. Blake Cisneros; 15. George Hayes; 16. Josh Kossek. CHARLOTTE, N.C. — The Charlotte 49ers, who will make their debut on the FBS level as a member of Conference USA this fall, will have the bulk of their games available to televised audiences across the nation as part of their extensive television package. The American Sports Network (ASN), a Conference USA television partner that distributes games throughout the country, has selected and assigned game times for six 49ers games. Clearance information for individual ASN games will be available as game dates approach. ASN selected three 49ers home games and three road games for its television package. Four other 49ers games had already been selected for national broadcast by ESPNU, CBS Sports Network and FOX networks. All six of the 49ers home games have been selected by a C-USA television partner. ASN will produce the 49ers home opener vs. Presbyterian, Sept. 12 at 12 noon; the 49ers first C-USA home game vs. FAU,Sept. 26 at 7 p.m.; and the 49ers Homecoming game, vs. Southern Miss on Oct. 24 at 12 noon. ASN will also broadcast road games at Old Dominion (Oct. 17; 3:30 p.m.), at FIU (Nov. 7; 12 noon) and at Rice (Nov. 28; 3:30 p.m.). Charlotte will have its season-opener at Georgia State televised on ESPNU, Friday, Sept. 4 at 3:30. The 49ers will host Temple, Oct. 2 at 7 p.m. in a non-conference game televised by CBS Sports Network. Two conference games: vs. Marshall, Oct. 31 and vs. UTSA, Nov. 14 will be televised on a to-be-determined FOX network with games times yet to be set. The television details for the 49ers road games at Middle Tennessee and Kentucky have not been released yet. MONROE, N.C. – Union Power Cooperative is the new title sponsor for the The Union Power Cooperative Gridiron Clash presented by ESPN Radio 730 AM set for Sept. 4 and 5. 151 Sports Marketing made the announcement Tuesday. The four-game high school football series will be held at Monroe High School’s stadium. Pinecrest versus Cuthbertson 7:30 p.m.
Charlotte Christian versus Weddington 4 p.m.
Hunter Huss versus Monroe 8 p.m.
Time Warner will be broadcasting the annual Battle for the Bell live Thursday, Aug. 20, from Memorial Stadium in Kannapolis. It will be part of the Great American Rivalries Series. The Independent Tribune has all the details about this year’s game and the broadcast. Concord has beaten A.L. Brown in the last three straight games. Pro All Stars Series (PASS) South Super Late Model points leader Zane Smith took the lead following contact between leaders Roger Lee Newton and Jeff Fultz with 11 laps to go and led the rest of the way to win Friday night’s Old Glory 125 at Concord Speedway. Smith’s victory came in the first race back at the venerable half-mile speedway in nearly three years. In qualifying, Jody Measamer scorched the half-mile triangular speedway with an average lap speed of over 116 miles per hour. Following the top 10 qualifiers redraw, Measamer would start third behind Roger Lee Newton and Tate Fogleman. Newton jumped to a quick lead at the start, but Ryan Moore and Corey Lajoie were the two cars on the move in the early going. After starting 20th, Moore made his way around Brandon Ward and into the top 10 on lap 34. Just two laps later, 11th place starter Lajoie passed Spencer Davis to move into the top five. On the final restart, Moore, who was running third at the time, spun entering turn one collecting Ward and Matt Craig. Smith led the rest of the way to claim the win over Fultz, Davis, Jared Irvan, and Fogleman. Rounding out the top 10 were Peltier, Newton, Derek Scott, Jr., Campbell, and Trevor Noles. Kodie Conner led all 50 laps to take his 4th PASS Pro Late Model win of the season over Austin Thompson, Adam Welch, Chandler Smith, and Ryan Krachun. Sonny Schofen took the Mid-Atlantic Street Stock win over a 25 car starting field with Bryan Thomas and Gary Ledbetter completing the top three. Burt Myers held off his brother, Jason, for his third KOMA Unwind Modified Madness win of the season. The PASS South Super Late Models hit the track again for 150 laps on Saturday, June 6 at South Boston Speedway, along with Twin 75s for the NASCAR Late Model Stocks and action for the USAC Eastern Midgets and Legends. CONCORD, N.C. (May 21, 2015) – For more than two decades, the Bojangles’ Summer Shootout Series at Charlotte Motor Speedway has served as a training ground for grassroots racers hoping to rise through the ranks to NASCAR’s premier series. Several current NASCAR drivers who got their start on the frontstretch quarter-mile were on hand Thursday to help U.S. Legends Car International officials roll out plans for the 21st annual summer series, which features intense Legend Car and Bandolero racing over an eight-week series in June and July. In addition to a new title sponsor, Bojangles’, the 2015 edition of the Summer Shootout Series will bring together the most competitive field of Legend Car and Bandolero drivers from across the country to compete for a coveted championship. NASCAR Sprint Cup Series drivers Joey Logano, David Ragan and Camping World Truck Series driver Daniel Hemric were on hand to talk about the family fun at Bojangles’ Summer Shootout. Ragan said it’s also the best place to learn the ropes of car control and racing and advance up the motorsports ladder. “With the harder tires and the handling of these cars, Legends racing is a great way to learn car control and how to race in traffic,” Ragan said, adding that the Summer Shootout provides some of the most competitive Legends racing out there, with drivers coming to Charlotte Motor Speedway from across the country to compete in the eight-week series each year. Continuing its partnership with MAVtv, the Bojangles’ Summer Shootout will once again be televised during 30-minute weekly highlight shows. In addition to the weekly highlight show, fans can watch live action through a pay-per-view for just $14.99 per night (or $9.99 per night when you order the full season). The Bojangles’ Summer Shootout on the Performance Racing Network will be co-anchored by Lenny Batycki and Bob Dillner, with former Miss Sprint Cup, Amanda Wright, working as pit reporter. For more details or to purchase a pay-per-view subscription for the Bojangles’ Summer Shootout, visithttp://www.GOPRN.com/SummerShootout. Adult admission is just $8 and children ages 13 and under will be admitted free when accompanied by an adult. Legend Car racing is divided into four categories based on a driver’s experience. The Pro division features veteran drivers, while the Semi-Pro category is for those with limited Legend Car experience. The Young Lions division is for those new to Legend Car racing and the Masters division is for drivers 40 years of age and older. Bandolero cars are divided into three divisions with competitors grouped by age. The Bandits division is for racers 8 to 11 and the Outlaws category features drivers 12 and older. The Beginner Bandits is for racers in their first year of competition. 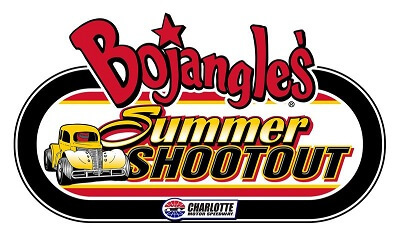 Competitor registration is now open for the Bojangles’ Summer Shootout Series.Click here to register. For more information on the Bojangles’ Summer Shootout Series call the Charlotte Motor Speedway ticket office at 1-800-455-FANS (3267) or visit the Charlotte Motor Speedway website. Connect with Charlotte Motor Speedway onTwitter, Instagram or Facebook fan. Keep up with all the latest updates from the track with the Charlotte Motor Speedway mobile app.